Male abdominal fat will hinder your efforts to meet women on the Florida beach. Male ab fat is a turnoff to chicks. However, you can lose belly fat and build lean muscle with a legitimate proven program. Before we go any farther, let's be clear...you can't burn belly fat just by doing thousands of crunches. The ONLY way you will lose male ab fat is through a comprehensive program that emphasizes intelligent nutrition, regular and consistent weight training, and structured cardio. There is NO WAY you can exercise off male belly fat and love handles. You must begin adhering to a nutritional program that focuses on conscious eating and making good food choices. The Florida beach has tons of beautiful women. Don't sabotage your efforts to meet them by looking less than your best. BURN THIS INTO YOUR BRAIN: Women like guys who look lean, fit, and athletic. They ARE NOT drawn to bulky, overly-dense steroid-infused bodies. They want guys who look like the Olympic athletes they see on TV, or movie stars who have the "lean Hollywood look." You can achieve this look. You can do it. Sure, it will take some work...but looking like an athlete is far more easy than looking like a juiced-up freak from a muscle magazine. Forget about protein shakes, forget about expensive (and worthless) medical-sounding supplements, forget about harsh workouts and mindless jogging before sunrise. You can lose belly fat and get rid of love handles by making a commitment to start eating consciously. This means you will know EVERYTHING you put in your mouth. You will NOT mindlessly snack on crap food or eat at fast food places. * First things first: It took time to accumulate belly fat and it will take time to get rid of it. * You WILL NOT look like an athlete after 12 weeks of a good diet and working out, but you will look a heck of a lot better. * Yes, you will build lean muscle mass while you are losing belly fat...but, it WILL NOT be Popeye-sized bulk like some websites hype. * To get rid of male abdominal fat, you must see sugar foods and processed foods as your enemies. They are the two food groups that sabotage fat loss efforts. * You must commit to learning how foods affect your body. You must know which ones build muscle and which ones are too easily stored as fat. * You must exercise portion control and have a realistic outlook on the calories you are taking in. No more going back for 2nd's...no more eating 4-5 pieces of pizza at a sitting. * Eating and training like an athlete must become a way of life...not just a 6-8 month program to get you ready for Spring Break on the Florida beaches. * Burning belly fat and getting rid of love handles hinge on a three-prong attack of conscious nutrition, regular weight training, and structured cardio. Of those three, solid NUTRITION (and portion control) far outdistances the other two for dropping fat. If you have read this far, you are sincere about wanting to get rid of male abdominal and lose your love handles. However, it is in your best interests to investigate the program that fits best for you. * The State of Michigan Surgeon General has a brief, but to the point criteria checklist for legit weight loss programs. It would be good to review this. * You want a program that gives it to you straight and is NOT just a bridge to sell expensive supplements or phony exercise gadgets. * You want a program that focuses on basic weight training exercises that focus on compound, multi-joint movements that will develop strength as well as lean muscle mass. * You want a program that will get you in..and out of the gym. You DO NOT need to be in there for two hours a day. * You want a program that will get you to incorporating interval training cardio since that is what athletes utilize to build their bodies. 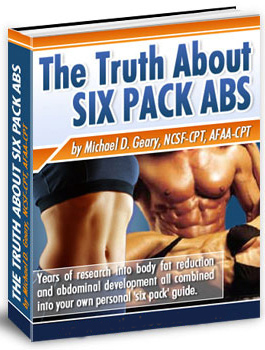 * The proven program we are becoming more impressed with is The Truth About Six Pack Abs by Mike Geary. You can set a goal to lose male abdominal fat and meet women more easily on the Florida beach and reach it. Yes, it will take some time, yes it will take some mental discipline, and yes it will take some sweat...but think of the reward when you take off your shirt and reveal a fit, muscular body.